The tunnels between Eastern Ghouta, held by the Syrian opposition, and remaining opposition-held areas in Damascus are a big business opportunity for those who control the movement of goods. Huge profits are made by all sides, not least dairy magnate Mohieddin Manfoush. Enab Baladi is an independent Syrian nonprofit media organization. It was established in 2011 by a group of citizen journalists and activists from Daraya, a Syrian town in Damascus suburbs. The name “Enab Baladi” means “The Grapes of My Country” and the name was chosen as a symbol of Daraya which is well known for producing the best grapes in Syria. (Eastern Ghouta, Rif Dimashq) The tunnels between Eastern Ghouta, held by the Syrian opposition, and remaining opposition-held areas in Damascus are a big business opportunity for those who control the movement of goods. Huge profits are made by all sides, not least dairy magnate Mohieddin Manfoush. In the first week of May 2016 a money transfer office in Istanbul raised its rate for a monthly money transfer to Eastern Ghouta from 2.5 to 18 percent. The increase – on a monthly transfer for the correspondent of the news website Enab Baladi – was justified because the tunnels connecting Qaboun and Barzeh to Eastern Ghouta had been closed due to the advance of Assad’s forces. [A video report on the tunnels that connect Qaboun to Ghouta (Wessam Al-Jurdi Facebook page/Fair use. All rights reserved to the author)]. The first tunnel, dug in late 2013, connected Harasta and an area that is an extension of the Qaboun orchards. The tunnel was dug by the Fajr al-Umma faction, and was about 875 yards (800m) in length. It opened in summer 2014, and was used to transport fighters and weapons between the two areas, which were separated by a highway. In addition to these long tunnels, there are unmanned underground passages used for secret military purposes. There also have been unsuccessful attempts to dig other tunnels. Ahrar al-Sham and Fath al-Sham, for example, embarked on digging a tunnel to connect Qaboun and Ghouta, but the operations stopped five months laterdue to the tense situation in Qaboun. [Pictures of Manfoush with Bishr Yazji, the Minister of Tourism from the Syrian Regime’s Government (Baseem Al-Bitar Facebook page/Fair use. All rights reserved to the author)]. Manfoush is not the only businessman who brings goods into Ghouta. Well-connected businessmen, faction leaders and Assad’s officers control the market and the movement of goods – and therefore people’s lives. 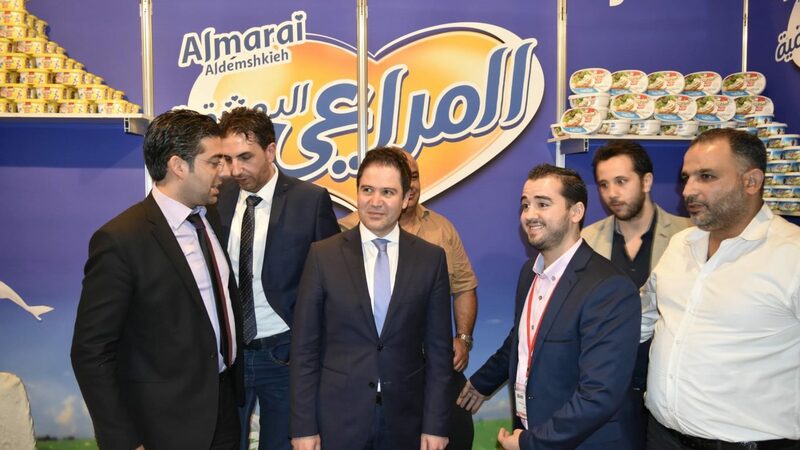 However, none of them is as well known and influences the market as much as Manfoush, after whom the main checkpoint at the city of al-Tal in Rif Dimashq was named. 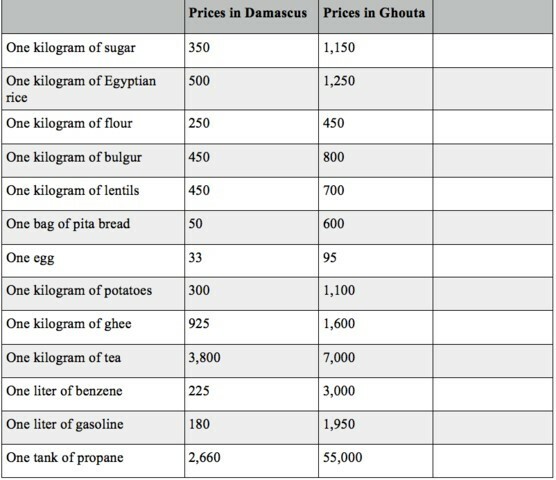 [The table illustrates the prices in Ghouta in comparison to those in Damascus during that time. (In early 2014, the exchange rate was 145 Syrian pounds to $1; it increased to 200 Syrian pounds to $1 in August and to 210 Syrian pounds to $1 by the end of the year)]. Since the tunnels were of paramount importance to the factions, security forces played a major role in managing and enforcing laws related to the tunnels. Therefore, our reporters met with one of the most prominent security officials responsible for the tunnels. He asked them to disclose neither his position nor his name, and chose to be called “Khaffash” (Bat). -Those passing through the tunnels must be born before 1970, since the factions are in need of young fighters. -The person passing must provide clearance from the Unified Judiciary, to prove that there are no cases outstanding against him or her, and a clearance from the Housing Bureau. -Fighters must provide an official permit from their faction. -All documents must be submitted to the Crossing Office, which will assign the person a date to pass. -Medical emergencies are exempted from the waiting period, but must provide a report from the Unified Medical Bureau. -Under no circumstances are weapons allowed to leave Ghouta. -No goods other than clothes and basic supplies are allowed (not to exceed two bags). 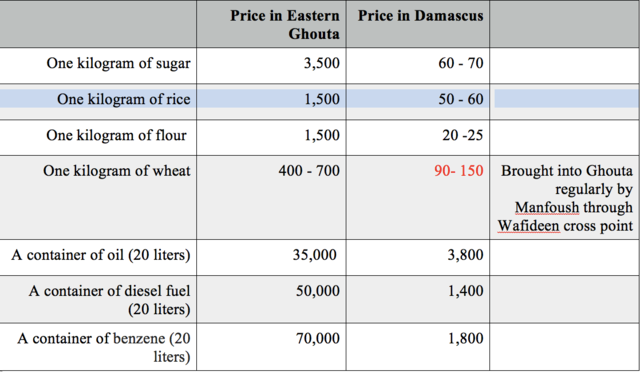 [The table shows the prices of goods in Eastern Ghouta in comparison with the prices in Damascus on May 20, 2017. (The exchange rate at the time was approximately 500 Syrian pounds to $1)]. [An Arabic version of this investigative report was originally published on Enab Baladi on July 9, 2017, as its contribution to The Syrian Independent Media Group (SIMG) project. SIMG is comprised of six independent Arab media organizations working together to highlight untold stories from the war-torn country: Al-Jumhuriya (www.aljumhuriya.net); Enab Baladi (https://english.enabbaladi.net/); Rozana Radio (http://rozana.fm/en); Syria Deeply (www.syriadeeply.org); Syrian Female Journalists Network (http://www.sfjn.org/en/); and Syria Untold (www.syriauntold.com/en/).The project is supported by International Media Support]. [Main photo: Rebels sit down to eat on the floor in the eastern suburbs of Damascus on June 22, 2017 (Ghouta Media Center)].